Stocks in America don’t go up and down because of what’s happening in America. Stocks in America go up and down because of what’s happening all over the world. This relationship also applies to bonds, commodities and currency markets. Today, I want to focus on what we’re seeing globally so we can make much more informed decisions about the current trend. Do we want to be buying stocks? 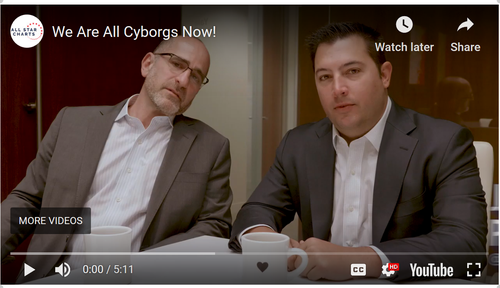 Or do we want to be selling them? 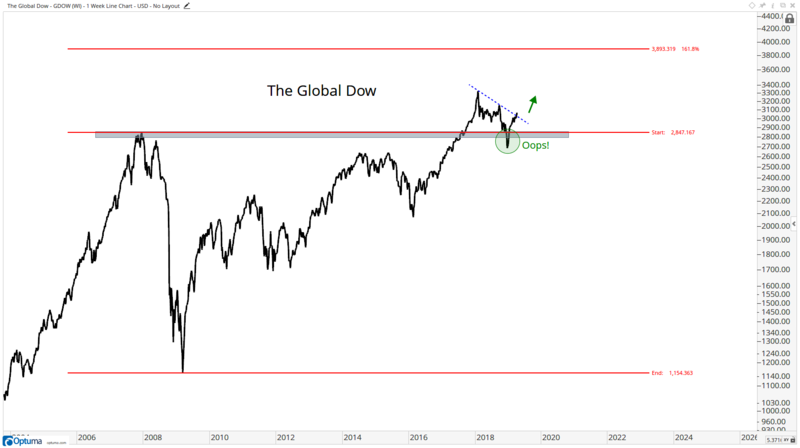 Let’s talk about The Global Dow Index breaking out above key levels this month. I don’t think there’s any reason to complicate things. It’s Technical Analysis 101 in many ways. 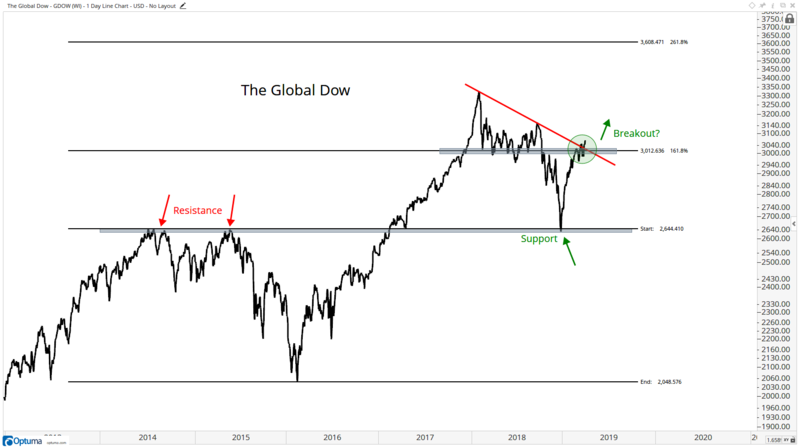 First, look how this index broke out in early 2017 above “resistance” throughout 2014 and 2015. After peaking last year, prices came down to “Support” from that former resistance. Now, we’re breaking out above the downtrend line from those highs. This key level also represents the 161.8% extension of the entire 2014-to-2016 decline. This is the most important reference point on this chart, as far as I’m concerned. If we’re above that 3,000 area, we want to err on the long side of stocks, not just in the U.S., but globally. U.S. stocks account for less than half of The Global Dow. The next-largest country representations are Japan, the U.K., France, China, and Germany. As for the sector breakdown, it’s 18% Financials, 20% Consumer Goods & Services, 12% Industrials, 12% Technology, 10% Healthcare, and 10% Oil & Gas. Again, that 3,000 level is key. If you’re bearish stocks and think they’re going lower as a group, it’s going to be hard to be right if The Global Dow is above 3,000. 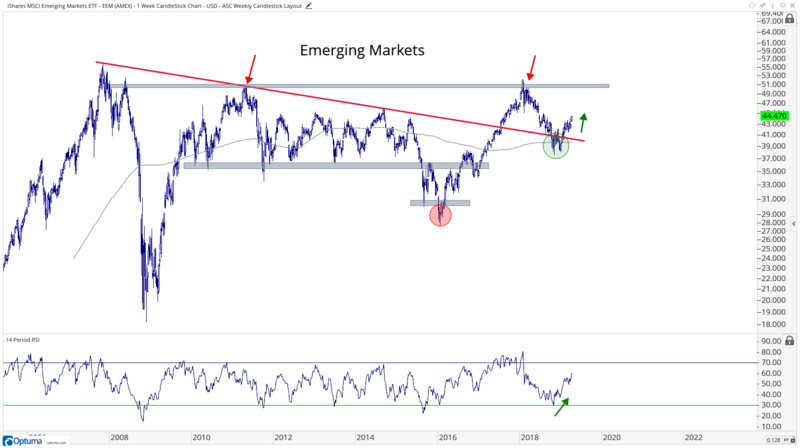 A lot of emerging-market charts have huge bases, too. Taiwan and Thailand are two good examples. Here’s the MSCI Emerging Markets Index Fund. Do we want to be buying this or selling it? The short term is still messy. 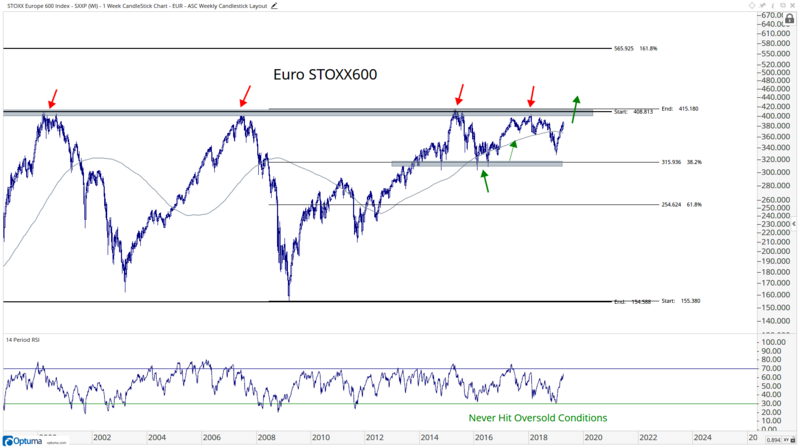 But, years from now, will we be looking back saying that these were quadruple-tops, or will these global indexes resolve in the direction of the prior trend, higher? Many of us are unaware of this problem, and even more people don’t even care to be aware. Is it the power that we have in our phones? Or do the phones have the power over us? Phil offers some advice on this front and shares what he’s been doing. Happy Monday, folks. Here’s to a great week.